Elections are mission critical projects. They take place over extensive territories; include thousands of candidates in hundreds of jurisdictions; require millions of election instruments to be under strict supervision while they are delivered throughout the nation; and they need the disciplined work of hundreds of thousands of poll station workers and subcontractors on a very tight schedule. Technology can play an important role in efficiently managing all these tasks. But unfortunately, although the technology has been available for years, it is only now that countries worldwide are beginning to consider the modernisation of election administration through technology. 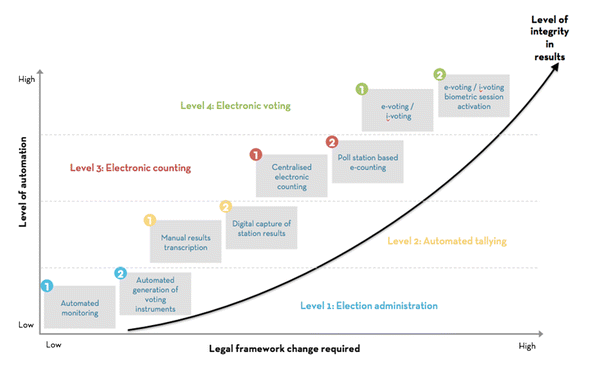 To help countries approach election automation, Smartmatic has designed the Election Automation Maturity Model. The model, which works as a frame of reference about election technology, is the result of years of watching commissions embrace different kinds of technologies. The model considers 8 basic levels of automation. Level 1, the minimum, is just the automated monitoring of a manual election, whereas level 8 includes a combination of e-voting (with machines), Internet voting and biometrics to authenticate voters and unlock voting sessions. Learn more about Smartmatic’s Election Automation Maturity Model in this article written by Antonio Mugica: The case for election technology.